Once in a while, someone asks us, "Hey Autostacker, why not just get a couple two-post lifts instead of a single Autostacker and pay about the same price?" We love two-post lifts, don't get us wrong, but they're definitely not for everybody. On the other hand, Autostacker is made for anyone who owns a car and has an appropriate garage or storage space. More specifically, here are 10 reasons you might want to get Autostacker instead of a two-post lift, even if you're a seasoned field tech or engineer. Not everyone is a tech or should be expected to think like one. When the majority of your population can't perform this basic task, it follows logically that that a two-post lift isn't for everyone. Simply put, if you can't change a tire, you're probably not doing oil changes and resurfacing brake rotors. However, even people who can't change a tire are drivers, and every driver needs a place to park. Autostacker is a parking lift first and foremost, and its purpose is to make parking safer and simpler. But keep reading—don't write off Autostacker just yet! We know mechanics love their two-posts (so do we). That being said, the vast majorities of mistakes that occur on those lifts are caused by minor slip-ups. Even the most experienced mechanic has to have his or her wits about them when loading a vehicle. It's all about knowing the vehicle's center of gravity, adhering to proper jack points, using truck adapters when appropriate, etc. 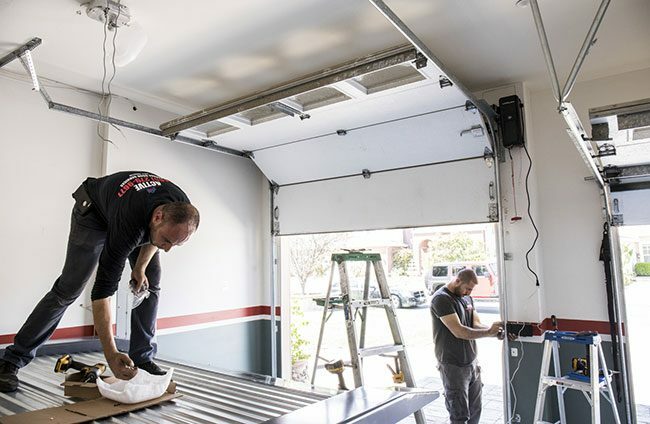 We're proud to have been in the business for a long time, and our customers are the best in the world, but there's no denying that driving onto a low-profile platform is easier than placing telescoping arms under a vehicle and lining everything up. Autostacker is even easier to use than four-post lifts, which require vehicles to perfectly line up along the runways. Because Autostacker has a full-width platform deck, there's less pressure to be perfect when driving on. The approach ramp and inclined deck offer unparalleled ease-of-use in the car lift arena. Autostacker solves this problem. It doesn't have posts, so it doesn't clutter the space or create an "industrial" look. Rather, it blends into any garage environment. Its sleek lines and fully collapsible scissor arms look powerful, smart and pleasing to the eye. The non-mechanic in your life will appreciate that Autostacker is designed with a safety-first mentality, so operators and vehicles can move vehicles in and out with full confidence in the lift—and perhaps renewed faith in the taste of their partner. One of the first considerations to make when buying a two-post lift is the thickness of the concrete at your installation site. The higher the capacity of the lift, the thicker the concrete needs to be to support the anchor bolts, which get longer as lift capacity and base plate size increase. Autostacker features an extended-length base, which gives it a wider center of gravity. Because of this, bolts are completely optional. Two-post lifts also experience significant inward torque on the columns, whereas Autostacker's hydraulics press directly against the bottom of your vehicle. This significantly reduces structural stress, as well as stress against the foundation. Ultimately, Autostacker should rarely ever require pre-planning or flooring adjustments, as long as there's enough room for installation. Two-post lifts are generally 3 – 4 feet wider than Autostacker. At that rate, you would lose one space for every three two-posts you installed. Autostacker is able to install in the width of the average parking space, so it's much more space-efficient than other car lift types. The only truly slimmer lift would be a mid-rise scissor lift or portable lift, and those are definitely not suitable for stacking vehicles. Ever seen an oil-stained Ferrari cruising the streets? Probably not. People with expensive cars tend to take care of them. If you can afford something beautiful and luxurious, you're not going to let it go to waste. But even your old, trusted and partially rusted 4-runner deserves better than to have paint-stripping fluids dropped on it all the time. An open-center lift is ideal for maintenance, but once the job is done, it's time to lower the car and park it somewhere else. Autostacker, like any other parking lift, has a full-width, drive-on deck. Vehicles are meant to have their shocks and suspension constricted and under a certain amount of pressure. While there are different schools of thought on this and how much hanging suspensions affect the suspension over time, some vehicles can experience failure of the shock absorber seals if left hanging for extended periods of time. The beauty of Autostacker is that it lifts vehicles higher than other parking lifts while taking up less space in your garage. If you have a low ceiling and two, low-riding vehicles to stack, you never have to lift it to the max level. Other parking devices that claim to be low-profile will still have side posts that restrict installation in some location. And if you do happen have higher ceilings, Autostacker will rise higher than two-posts, which offer just 69" – 75" of rise. When it comes to doubling a parking space, there's arguably never been a more versatile lift than Autostacker. The increased overhead clearance lets you park some truly heavy-duty vehicles in the lower level, which is ideal if those vehicles exceed Autostacker's 6,000-lb. capacity. Natural disasters, as we've all been learning lately, can be destructive and unpredictable. Two-post designs are not equipped to safely hold vehicles in the event of an earthquake or other seismic, ground-shaking conditions. Autostacker is built with a more stable base, and the wheels remain secure at all times in the wheel trough. Your vehicles are safer on Autostacker than they are on a two post, and our parking lift's dual-locking mechanisms are virtually impossible to accidentally shift out of place. In other words, your vehicles are extremely well-protected at all times. The entire Autostacker shipment consists of just a few main pieces, the power console and the interlocking platform deck paneling. Once the two scissor superstructures are up and connected by the front-end cross member, the process is basically just bolting down the deck and running hoses to the power unit. Two-posts require more time, cost and effort than this to install. As mentioned before, there may also be necessary concrete prep, which is never an issue with Autostacker.